Western North Carolina is classified as a temperate rainforest ecosystem. Most people are surprised to hear this, but not organic gardeners. With our fair share of diseases affecting every plant you can imagine, organic gardeners often feel like we’re in for total losses as we encounter steamy humidity, hot temperatures, and seemingly endless rainfall. Since plant diseases love these climatic conditions, chances are disease control will be your biggest challenge as you develop your organic gardening skills. This post is meant to give you a crash course in the most common disease organisms, general tips for prevention, and specific treatments for problems you may encounter. Fungi– grow on or through plants via thread-like mycelium. Fungi require either living plant hosts or decaying organic matter to survive. Fungal pathogens are the greatest challenge in our region. Bacteria- Single-cell organisms that need a living host to survive. Bacteria reproduce readily when they have warm, moist environments and a host plant to feed on. Viruses- Sub-microscopic organisms that invade the host plant’s cells and then multiply. Viruses spread via infected pest insects, known as vectors. First, let’s explore some good, preventative measures that you should always try to take. Every season, re-visit this list and try to improve. Strive for healthy soil with lots of organic matter, which will provide good even moisture and good drainage, as well as plenty of nutrients that plants need to stay healthy. Visit our post on feeding the soil for more info on how to achieve dreamy garden soils. Note: soil building will be a goal that lasts throughout your garden career. It takes years, and should be considered an investment. Maintain good airflow between plants, by ensuring adequate spacing, minimal weeds, and varied architecture (i.e have tall and short plants together). Pathogens love stagnant, hot air. The better the air circulation, the better your chance of avoiding infection. Water enough but not too much. 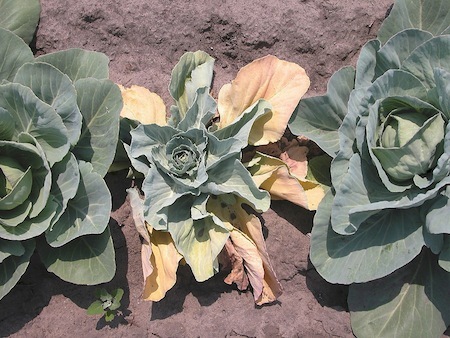 Most pathogens thrive in moist to wet environments, especially as the weather heats up. Make sure you water enough to meet the requirements of your crop plants, but be especially careful about stagnant water in the garden, and plants that sit at the bottom of the garden that might collect runoff after heavy rains. Going back to #1, the healthier the soil, the better drained it will be, which will aid in your attempts at optimum water balance. Look for disease resistant varieties of veggies. Note that many hybrid vegetables are bred to resist diseases that are known to affect that particular crop plant. Read this Ask Ruth article to learn why hybridized seeds are NOT the same as GMO seeds. Be careful with your hands and tools because many pathogens can spread in water, on tools, on your hands, on clothes, hats, water hoses, etc. The cleaner you keep everything, the better. Also, if you suspect a group of plants have an infection of some sort but you haven’t ruled out nutrient deficiency and don’t want to remove them completely, remember to wash your hands after handling them before handling healthy plants. This will prevent the spread of disease in the garden. Keep garden beds free of decaying debris like weeds you’ve pulled, or leaves you’ve stripped during harvesting. Fungi and bacteria like to grow on decaying organic matter. There will always be some decaying organic matter in an organic garden, but the less you contribute the better. Take weeds to your compost (only if you manage an active, hot pile) or your burn pile. Be especially aware of weeds that are in the same plant family as your crop plants, such as black nightshade (related to potatoes, tomatoes, eggplants, and peppers), as diseases that love a specific family of food plants will often get their start via weeds from the same plant family. Rotate crops. Changing the planting area of crops every season will help prevent disease, especially soil-borne pathogens. Rotating your crops by family will provide extra protection. For example, if all your nightshades are in one area this season, make sure to put them as far away from that area as possible next season. Now that you’re armed with some effective preventative measures, let’s get down to the nitty gritty, and take a look at some common pathogens in WNC gardens. 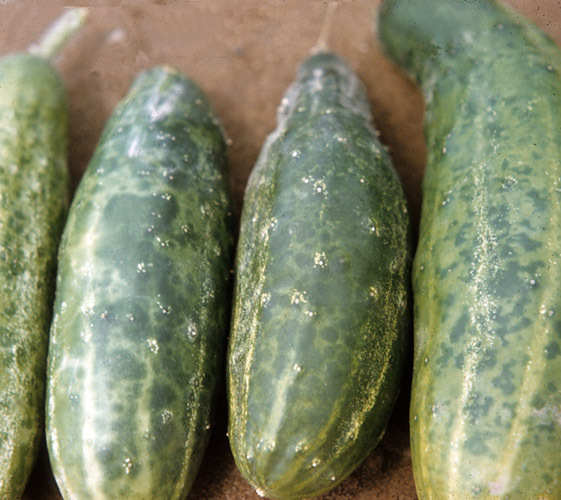 Downy mildew effects cucurbits like melon, cucumber, squash, and pumpkin. There is also a downy mildew that plagues basil Powdery mildew is another common mildew, and can be seen on many plants both food and ornamental. In the flower garden, lilacs are susceptible, as well as roses. In the veggie garden, cucurbits often fall victim. 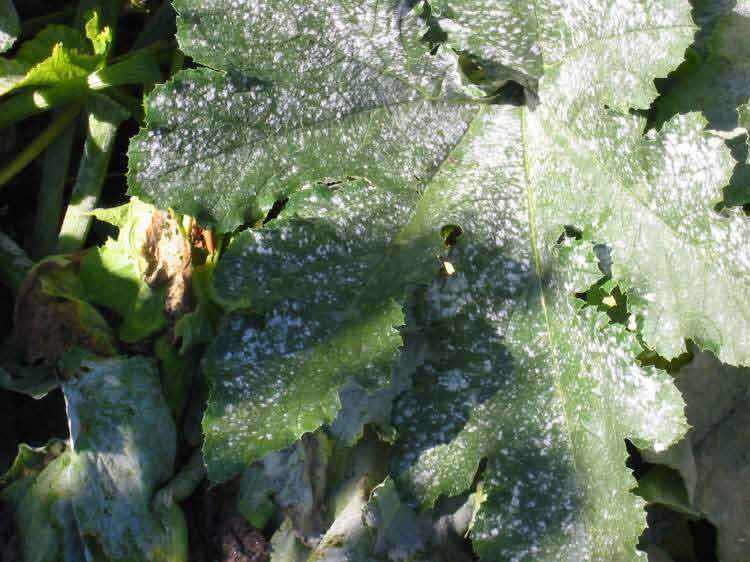 The good news about powdery mildew is that it is species specific, meaning that the particular strains are partial to specific types of plants. So, your lilac will not give powdery mildew to your pumpkin. Both downy and powdery mildews just love stagnant, warm air and spread on the wind. plant more successions of effected annual crops like squash and cucumber, making sure to cover each succession as soon as you set it out into the garden. Calcium silicate used as a fertilizer has been shown to reduce the chances of mildew in organic cucurbit crops. OGS is still looking into this idea, and into the particular product to use, but research out of Rutgers University suggests Wollastonite powder. Phytophthora: Also known as “water molds” phytophthora pathogens are not actually fungi, but they closely resemble fungi, so we’ll throw them in with the others. 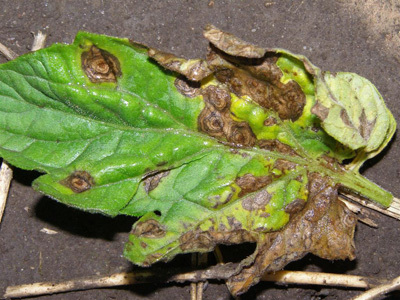 Phytophthora is what causes late blight in tomatoes, and other similar wilting diseases in almost any vegetable and ornamental crop, as well as many trees. Phytophthora is characterized by a slow wilting of the entire plant, starting at the bottom with the oldest leaves, and progressing upwards. The group of pathogens spread via spores, so wind can transmit them, as can your hands and clothes, wild animals, equipment, water, you get the drill. Prevention is key for Phytophthora, as there is little aid once the disease has established itself in your garden. Regulate water carefully to ensure plants are not getting too much. In seasons of overwhelming rain, this may be out of your control. Ensure good airflow. This is especially important in tomato crops. Keep plants pruned, space them adequately, and keep them up off of the ground. Keep good cropping records and rotate crops religiously. Choose resistant varieties, and be sure to purchase clean, healthy seed or transplants. Keep your hands, as well as tools and equipment sanitized while working. Provide a cover for plants such as a high tunnel with open sides. Do not prune or otherwise work your plants when they are wet. Don’t leave debris in the garden for fungi to feed on. Remove weeds to ah ot compost pile or a burn pile away from the garden area. Copper Sulfate is approved for organic use, and offers strong defense against fungal pathogens. Be sure to follow all safety and application instructions, as copper is a potent control method, and should be used responsibly. A spray regimen of serenade and copper sulfate in rotation has been effective for many small farmers in WNC. You must spray the plants thoroughly (even the undersides of leaves), make sure to spray weekly, beginning at planting and up until frost. Streptomyces griseoviridis (MycoStop) is a bacteria you can use to inoculate the soil. It’s organic approved, and listed as a control for Phytophthora. Septoria: Also known as leaf mold, Septoria causes brown and yellow spots on plant leaves and leads to leaf wilt. As a leaf fungus, one might think that septoria doesn’t pose too much of a threat to fruiting plants, like tomatoes, however, Septoria fungi can lead to severe sun scald since the fruits are no longer shaded by leaves. 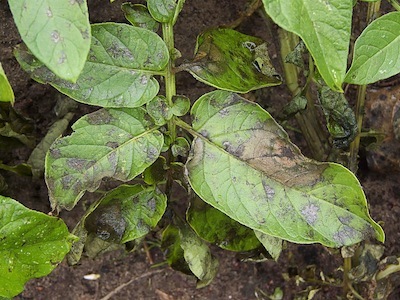 Septoria is usually a problem on nightshades such as tomatoes, potatoes, eggplants, and peppers. It also affects celery. There are over 1000 species of Septoria in our region, and the fungi are known to survive on seeds. Prevention is key for Septoria, as there is little aid once the disease has established itself in your garden. Maintain good air flow, and for plants that are susceptible like nightshades, put some extra space between species to prevent spread of Septoria from infected plants to healthy plants. For example, don’t plant peppers right next door to eggplant. Put some basil or marigolds in between. Don’t leave debris in the garden for fungi to feed on. Remove weeds to a hot compost pile or a burn pile away from the garden area. Make sure your hands, as well as tools and other equipment are sanitized before working, and be careful to leave the sick plants for last so you don’t carry fungal spores to healthy plants. Mix 1 T horticultural oil and 1 T baking soda per gallon of water. Spray weekly as soon as you set plants out. The mix can clump so be sure to shake or stir frequently as you go. Fusarium wilt is a real doozie of a pathogen, causing big losses when it crops up in the garden. It can persist in the soil for years, and render planting areas virtually useless for long periods of time. It causes total wilt of plants, which can start with yellowing of lower leaves. Fusarium thrives in hot temperatures when the soil moisture is low. Be sure to keep soil evenly moist, especially in the hottest months of the season, without flooding the garden and inviting other pathogens to thrive. Solarizing effected soil by covering with black plastic and leaving it undisturbed during the warm season can kill fungus. Early Blight is a very common, soil-borne bacteria that effects gardeners in WNC. It causes brown spots with yellow rings on leaves and fruits. Early blight is also known as common blight, and commonly affects tomatoes and other nightshades. Unlike late blight (which is a species of phytophthora, see Fungal Diseases, above) which can kill entire plants in a day, a plant infected with early blight can persist if effected leaves are removed throughout the season. Very bad cases will result in damaged fruits. Water from below to avoid soil splashing up onto lower plant leaves. If you grow outside, this will be difficult, since rain showers cannot be controlled. If you can water from below using a soaker hose or drip irrigation AND provide a well-ventilated cover for plants to protect them from the rain, you’ll be all set. Follow a preventative spray regimen, see products below. Make sure you purchase clean plant stock, from a trusted source. Keep equipment that you use for working the soil cleaned between uses, to prevent persistence of bacteria on your tools. If you do see blighty leaves (usually on the bottom of the plant closest to the soil), remove them and throw them away immediately, far from the garden. Do not prune, or otherwise handle your plants when they are wet. A spray regimen of copper sulfate and serenade in rotation has proven helpful to some farmers in WNC. Be sure to spray thoroughly (even the underside of leaves), and begin a weekly spraying from planting until frost. 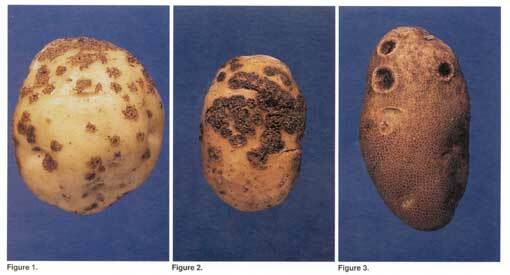 Soft Rot is characterized by mushy soft spots in underground crops like onions, sweet potatoes, garlic, and potatoes. Make sure to harvest crops when they are mature, and don’t leave them in the ground too long. 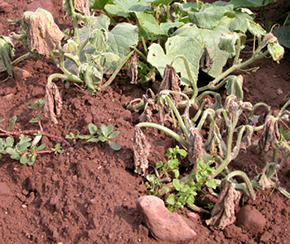 Bacterial Wilt affects cucurbits, particularly cucumbers. It causes plants to wilt and die, and is transmitted by cucumber beetles. Keep close control on cucumber beetle populations to prevent spread of bacteria. 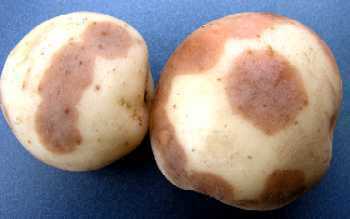 Scab looks just like it sounds- rough, raised areas on the skins of underground crops, usually potatoes. There are no varieties that are resistant to scab, and little you can do to stop it once it happens. The best way to deal with scab is to prevent it. Avoid applying lime in the spring. Look to lime your soils in the fall, as a rule. Purchase clean seed from a trusted source. OGS likes Wood Prairie Farm, in Maine, and local supplier Sow True Seed also provides seed stock. 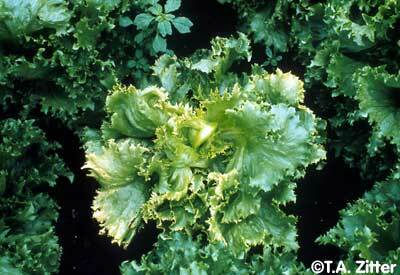 Aster Yellows is a disease that commonly effects lettuce. It is characterized by yellowing of leaves, usually beginning at the veins. It can lead to stunted growth and twisted leaves. It is spread by leafhoppers. Control leafhopper populations with hot pepper spray or garlic oil soap spray. See our post on organic insect control for more info and spray recipes. 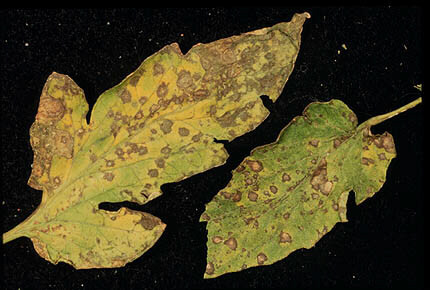 Cucumber Mosaic Virus, also known as Tobacco Mosaic virus, affects nightshades and cucurbits with mottled, yellow spots that look like a mosaic on the leaf surface. Avoid tobacco use around plants, and if you do smoke or chew tobacco, wash your hands thoroughly before handling plants. Cucumber beetles are vectors of this virus, meaning they can transmit it from plant to plant. 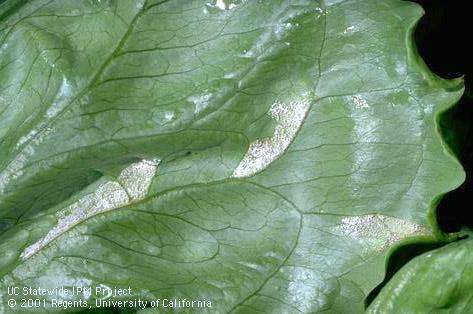 Control cucumber beetles to prevent this disease. See our post on insect control for tips. Make sure you clear weed debris from the garden area and sanitize tools and other equipment between uses. If you would like to see specific information on any diseases not listed here, consider submitting a question to Ask Ruth, our gardener advice column in OGS’ montly e-newsletter. Sign up for the newsletter here, and submit questions to enews@organicgrowersschool.org.